When I was a kid, we had a goldfish. My mother took care of it, regularly changing the water in the tank. But one day, she poured in hot water instead of cold, and when she put the fish back in, it very quickly stewed to death. I don’t have any direct recollection of this happening: it’s one of those mythical family stories shared over the table, with only loose and doubtful connection to factual truth. The next goldfish entered my life in 2007. Philip and I were living in a 25 m2 one-bedroom apartment in Belleville. One day, when I got back home, he asked me: ‘Did you notice anything different in the house lately?’ I looked around, puzzled ‘No’, I replied, ‘is there something?’. Then he pointed at the kitchen bar, where a new fish tank was sitting. ‘Did you just get this, how fantastic, I didn’t notice.’ He laughed: ‘it’s been around for three days, I thought it was time I told you.’ I took a serious liking to that fish, but it died of leaking paint from an Eiffel tower we placed in the water. Our next fish died of a similar fate, caused by a golden statue of St Theresa purchased in her hometown of Lisieux. A house-sitting guest replaced our third fish with one almost identical while we were away. And eventually, we gave that fourth fish to a local friend when we left for Australia, and never heard any more about it. Our current fish are themselves hand-me-downs. Philip got them from a couple moving to Sydney who offered a free tank and three fish on twitter, about four years ago. 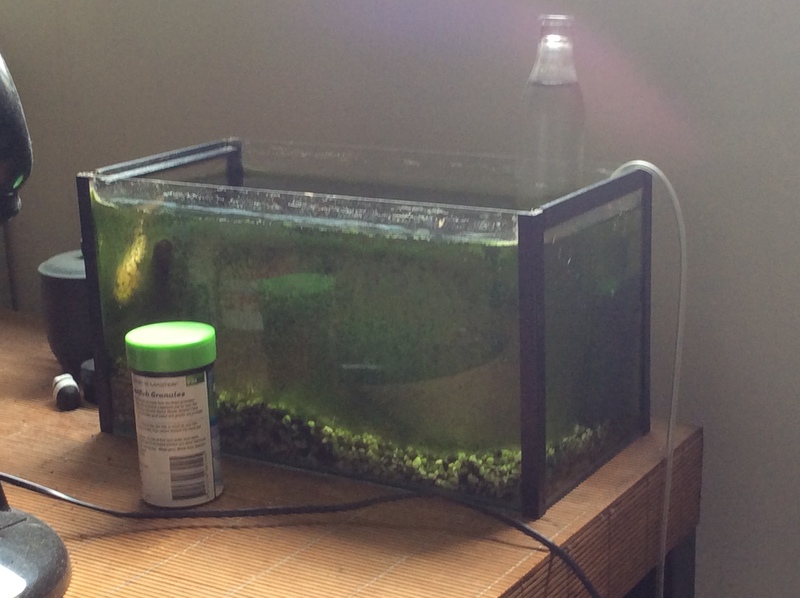 The tank is a large rectangle, roughly 50 cm long, 20 cm deep and 25 cm high. The glass panels that form it are held together by angles of rigid black plastic glued to the glass with translucid white putty. A semi-circular air pump stands in one of the corners, spouting out a constant stream of little bubbles. A small glass bottle full of water holds it down (it was picked up from an Italian cafe during a trip to Rome in 2011, and originally contained non-alcoholic sparkly bitters), and a long transparent thin tube goes down from the top of the pump to a vibrating blue rectangle on the floor, bearing the words ‘AirTech 2K0AU’ in silver capitals, and plugged into a powerboard. The fish tank floor is covered in a layer of small black and white gravel. The fish swim around two plastic plants, one with red-veined leaves, the other a round, mossy green bush. Originally, there were three fish in the tank – one of them, with big bulbous eyes (I have now forgotten its name), started floating sideways about a year ago, and eventually, Philip decided to take it out of the tank, and let it die in a separate pool of water. Two remain: a flat pink-white one called Kate, and a slightly rounder red-orange one called ‘Sashimi’, with a wide spreading thin tail. Both names were chosen by their previous owners.